Most schools aren't immune to haunted or paranormal activity. In fact, some of the most convincing evidence of ghosts has been documented at scary haunted schools and colleges across America. An internet sensation as one of the most haunted schools is, "Poky High". This haunted high schools is perhaps one of the best documented school hauntings thanks to security surveillance cameras. Several minutes of raw security video taken during a school holiday at night when no one was at the school reveals an erratic light show and a ghostly figure in the school hallway. Idaho State Journal reported on the incident. During the investigation of the original security video it was noted that the lights flickered off and on in an erratic pattern, and a grayish white figure moved from a sitting position along a wall and then moved into a hall bathroom, re-emerged, went back into the bathroom and then walked down the hall away from the camera. Former "Poky High" principal Don Cotent talks about his late night experiences with the paranormal. Cotent states that on three or four occasions, he was disturbed from his work by the sound of someone banging beneath the floor with something like a broom handle. He says on each occasion, he stomped his feet and yelled to the intruder that he was busy and didn't have time for such distractions. The video footage was captured during the winter holiday break, but when the students returned to classes, teachers and students reported more unexplained incidents of paranormal activity. The school eventually brought in a paranormal investigative team that surmised the ghostly activity might be related to six deaths on the school property and the 1914 fire that destroyed the original building (the school was rebuilt in 1918). 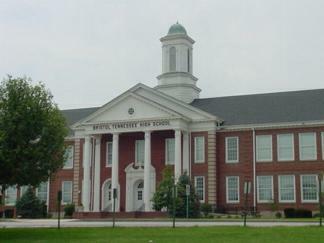 Prairie Ghosts reports Tennessee High School has three resident ghosts. Built in 1939, the school was originally known as "Fifth Street School." It has since been added onto twice. The ghosts seem to be tied to the original part of the school. The high school student ghost known as Agnes was killed on her way to a formal school event, Class Night. Her car was struck by a train at the railroad crossing. Ever since her death, students and the staff have reported that Agnes haunts the school. There's even a report of her appearing in the "television broadcasting booth of the auditorium." Another presence in the school is a phantom train that is believed to be the spectral manifestation of the one that killed Agnes. The train suddenly emerges from the gym and roars noisily down the hallway. This phenomenon is so intense the school hallways and rooms shake in its wake. The third ghost is of a former athlete that students report seeing and even encountering him at games. The boy was hit by a car one night while walking home from a game. It's believed his spirit now resides at the school. The Lincoln High School in Sioux Falls, South Dakota was opened in 1965. It's also claimed to be a highly haunted school. There have been no known deaths on the premises, yet students, teachers, and janitors report a tall apparition and other paranormal activities. Three high school students conducted an investigation of their school in a documentary that includes interviews with teachers and the janitorial staff. One witness also tells the story of her friend's deceased husband speaking to her when she entered a room. He said, "Char come here I got a joke to tell you." This was something he said often when he was alive and would then proceed to tell her a joke. This El Paso school made the top ten list of scariest schools on the Mandatory website. According to Mandatory, "El Paso High surpasses all the other schools when it comes to scare factor." Perhaps the most alarming is a ghost photo taken of the 1985 graduating class. In the center of the photo is a blurry image of what appears to be a student dressed in white. Mandatory reports that there was "no one standing there when the picture was taken, nor can the female in question be identified." Some believe the ghost is a young girl said to have committed suicide at the school by leaping to her death from a balcony overlooking the hallway where the mist is often seen. Some students claim to have seen the ghost girl jump from the balcony, but disappear before she makes it to the floor below. Tragically, one of the school's football players died from a broken neck during a game on the school's athletic field. Many witnesses claim to have seen his ghostly figure running along the football field. Haunted Hovel reports the high school has three resident specters. Built in 1965, the high school has been plagued by stories of ghostly encounters and unexplained paranormal events. No one knows who Mabel was, how she died, why she's at the school, or even how her name is known. She likes to hang out in the auditorium appearing back stage, especially on the winding staircase. Witnesses report she is a trickster and enjoys turning stage and other lights off and on. She moves stage props and even makes props disappear. The next ghost is said to be malevolent. She wears a purple hat and attempts to coax people who see her to follow her. Witnesses report having a foreboding feeling and sensing evil energy coming from her. The next apparition moves about the entire school, but seems to favor hanging out in the halls. Witnesses have reported being in the halls when there was no one or just a few people on campus and sensing someone staring or glaring at them. Some people believe it is the spirit of a boy who was killed by a train. In the video below, one of the Roy High School teachers recounts how he and another teacher heard a very loud pounding coming from the inside of an old dark room studio. No one was inside and couldn't have gotten inside since the abandoned room was always locked. Prairie Ghosts tells the ghost story of Urbana High School. The tower is considered the most haunted part of the building. Rumors state a secret doorway leads to the tower, and only a few people know its location. Located in the upper section of the building, there were once active classrooms there but the area was closed off years ago. In 2014, USA Today highlighted the SyFy Ghost Hunters investigation of the Elizabeth "Lizzy" V. Edwards School in Barnegat, NJ, named for its "original schoolmarm" who taught until she died in 1965. The building is abandoned due to financial issues and has sat vacant since 2004. 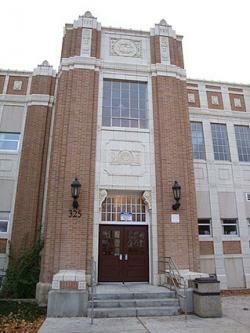 Built in 1930, it was used as both a high school and an elementary school. 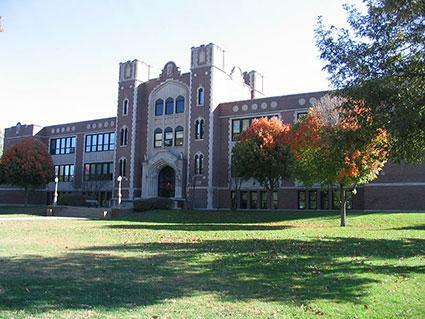 USA Today reports, "… some school officials believe the building" is haunted. They feel it's "... still inhabited by something, or someone, otherworldly." Some believe the ghost haunting the school is Lizzy. She's considered to be a "good ghost." Lizzy along with her fellow ghosts spend their time "slamming lockers, turning lights on and off, and playing 1940s music for no one in particular." An apparition of a "translucent woman wearing a floral print dress with her hair piled up high onto her head"
Ashbury Park Press (APP) created a short documentary featuring retired police detective Bill Cox, who now serves as transportation and security coordinator for Barnegat schools. Cox admits it was difficult for him to accept the things he's witnessed, but that something is definitely going on in the school that could be called paranormal. He further admitted that whenever he's in the building, he feels as though something or someone is watching him and wondering why he's there. Williamsburg, VA was founded in 1699. Matthew Whaley was born in 1696 and died 9 years later (1705). It's believed that the colonial boy's ghost still haunts his namesake school, one of the most haunted elementary schools in the country, even though the school has been relocated three times within Williamsburg. Matthew Whaley died at the age of nine from an unknown cause, and his mother sought to honor him by adding on to the "small grammar school" he attended. The school was called Mattey's School. The Revolutionary and Civil Wars took their toll on the school house. It was moved once before relocating to its current address, 301 Scotland Street in Williamsburg, and is known as The Matthew Whaley School. The two boys seen playing with Matthew on the school grounds are believed to be the victims of brutal beatings and lynchings. Whoever these male spirits are, they are joined by many other specters wandering the streets and buildings of this historic colonial city. Old Milton Elementary School was built in 1904 and remained a school until 1984 when it was abandoned. In 1990, it was purchased by a decorative glass manufacturer that still maintains its business in the building. Man believe the ghost story surrounding this building is nothing more than a myth. The event supposedly took place sometime during the 1930s when a janitor raped and murdered a school girl named Mary in the school's gym locker. Weeks later the janitor hanged himself from an exposed beam in the school hallway. Soon after the murder and suicide, teachers, students and visitors began to see and hear things that could only be described as paranormal. When women visited the area where Mary was murdered, they often felt nervous and uneasy. A paranormal investigation and psychic exorcism of the malevolent spirit were part of a 2010 Ghost Hunters episode on SyFy Channel. When the glass company moved into the building, the employees began to have similar ghostly experiences. One female employee even felt that she was being stalked by the janitor's spirit and eventually quit the company. One of the most eerie hauntings happens at the historic Fallsvale Elementary in California. Nestled in a forest, the old school's claim to fame has been the tales of the ghost children many students and teachers claim to have seen. These apparitions emerge from the surrounding forest. They move about and play, apparently interacting with the school children. The children who currently attend the school take these ghostly encounters in stride. In fact, the ghost children are such a common occurrence that the children know their names. It is possible that the old, abandoned school that is still on the property might hold the key to the mysterious ghostly children. Some paranormal investigators believe the building might be the hub of the activity instead of the forest. There are many ghost stories about haunted schools that are little more than myths, but many others that have credible witnesses to strange and unusual events. Paranormal encounters have been witnessed by students and teachers, but remain mysteries. Since most of these schools are still active as educational institutions, it is not advised to visit them without first contacting the school staff and asking for an appointment.